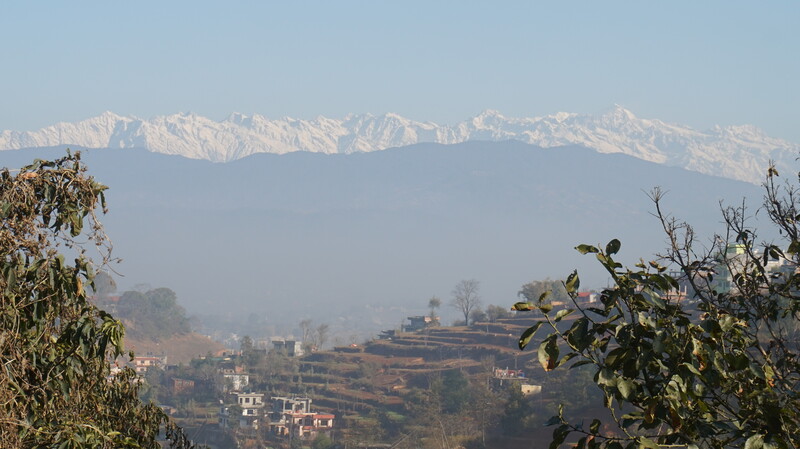 Historically, Nagarkot was a royal retreat. The King, his family, his court would come to Nagarkot in the summer to vacation from hectic city life and the heat of the Kathmandu Valley. Also, it is one of the most scenic spots in the region, renowned for its sunrise and sunset views of the Himalayas. In the 1960’s, with the first Western tourists, it became a destination ofpicturesque rural scenery, of terraced rice fields, green pastures, and marvel of the sunrise and sunsets. Nagarkot is a village located at about 32 kilometers east of Kathmandu. It is located on the northeastern rim of the Kathmandu Valley at an elevation of 2195 m/7200ft above the sea level. Seen from Nagarkot are Manaslu (8163m), SisaPangam (8013m), Langtang Lirung (7227 m), Gaurishankar (7145m), Mt. Everest (8848 m) DorjeLakpa (6979m), and Bhairab Takura (6759m). And as well, there are several monasteries and temples of interest. The hike to Nagarkotis short and follows the ridge of the valley. It is a popular trail for mountain bikers. It is possible to drive to Nagarkot, and common for visitors is to drive up, spend the night in a lodge, and walk down the next day. The walk ends in Bhaktapur, with its the famous, historical temple/palace complex. Himalayan Vacation Treks and Expedition will organize short trips to Nagarkotaccording its guest’s wishes. Recommended for maximum enjoyment is the following itinerary for the visitors who want to experience Nepal but who are restricted to the Kathmandu area, and/or are spending only a week in Nepal. Day 01: Arrival in Kathmandu, welcome and transportation to hotel. Our Guest’s security is of dominant concern to Himalayan Vacation Treks and Expedition. Please understand that the HV Treks trekking leader has the authority to adjust or cancel any part of the itinerary if it is found prudent. Unfavorable circumstances may occur during the trek. Such as dangerous weather conditions, the condition of a group member, natural events like landslides, can force changes in the itinerary. All efforts will be made to keep to the planned itinerary. The HV Treks leader will try his/her best to ensure that the trip goes smoothly and according to plan, but please be ready to be flexible if necessary. Himalayan Vacation Treks and Expedition is capable, experienced, and prepared to give 24-hour emergency response to any accident or condition that requires attention or evacuation. Himalayan Vacation Treks & Expedition requires that trekking and expedition guests have Insurance Policies. A Travel Insurance Policy should cover the cost of emergencies (including altitude sickness), injuries, and evacuations. Please, it is essential to bring your Travel Insurance Policy, or copies of your pertinent existing insurance coverage with you to Nepal. HV Treks will require a copy for our office records. We, as well, advise you to inform your existing insurance agent/company of your itinerary, including trekking, climbing, and hiking, and insure your current policy provides sufficient coverage. Nagarkot is a village located at about 32 kilometers east of Kathmandu. It is located on the northeastern rim of the Kathmandu Valley at an elevation of 2195 m/7200ft above the sea level. Seen from Nagarkot areManaslu (8163m), SisaPangam (8013m), Langtang Lirung (7227 m), Gaurishankar (7145m), Mt. Everest (8848 m) DorjeLakpa (6979m), and Bhairab Takura (6759m). And as well, there are several monasteries and temples of interest. Himalayan Vacation Treks and Expedition is capable, experienced, and prepared to give 24-hour emergency response to any accident or condition that requires attention or evacuation. Accommodation in Home stay during the Hiking. Down jacket and sleeping bag and trekking Hiking shoes . It is called the winter season in Nepal. It is a season for snowfall in mountain region above 4300m in Nepal. So trekking is possible below 4500m during this period. This season is noted for occasional snowfall at higher elevations in Himalayas. Though it gets colder in night, often it offers the clear day / blue sky and relatively less trekkers on the trail.Sunrise and Sunset are seen very clear and beautiful in this season. So tourist who wants to pass short holidays during this period Himalayan vacation Treks and Expedition welcomes to see splendid view of nature. During this period, we arrange family tour to experience natural beauty with short hikings and cultural tour.It is suitable for homestay tour through which different rituals and culture can be experienced during this period. The famous homestay like Sailung Timal homestay,Timal homestay, Tamang Heritage Homestay, Ghalegaon Homestay are the special places to visit. Himalayan Vacation Treks and Expedition arranges tour for this places. Chitawan National park Bardiya National Park are also the places to have live experience of culture and rituals. It is rainy season in Nepal. As it is the season of heavy rainfall. it is also known as the crops harvesting season in Nepal. In this season, trekking is slight difficult in Nepal. These times are blessed for the keen botanist as the higher valleys and meadows blossom with flowers and lush vegetation. Trekking in the rain-shadow (places are out of reach of the rain clouds because of the high mountains) areas north of the Himalaya like Upper Mustang and Dolpo could be an ideal trek selection. However, Himalayan vacation Treks and Expedition arranges tour and trek during this period in dry areas. We arrange treks and tour in dry areas like Mustang , Upper Dolpa , Leh Ladakh (India) and Tibet. Moderate temperatures, clear sky with outstanding views, making it a great time to do any of our trek. Occasional short storms may dump snow at high altitudes.This is the season of feast and festivals. This is also known as the special season for flowers in Nepal. Marigold is the popular and found best in this season. Temples and holy places are visited during this period. Festivals like Dashain , Tihar and Chhath are celebrated during this season. Long national holidays are offered for this festival for civil workers. This season is known as the king of the season. No rainfall, sunny days and moderate temperature are the most favourable factors of this season for treks and tours in Nepal.Every kind of treks and tours can be done during this period.So many tourist come to see beautiful Nepal in this season. Many trekking routes are full of tourist during this season. Peaks 6000m to 7000m are the best destination for climbing in this season.Himalayan Vacation Treks and Expedition welcomes tourist to feel the splendid view of nature of Nepal in this season. This list is a guideline to help you pack for your adventure. Please understand that the items listed below will vary according to the season and the duration of the trek. The weight limit for your luggage is 33 pounds or 12 kg. Your gear will be carried by your porter and you will be required to carry your own day-pack (with your valuables and things of immediate importance to you). We also suggest that you pack only what is necessary. Our list of equipment is prepared on the basis of our long experience. The Himalayan Vacation Trek & Expedition Team leader will check your gear to insure you have all necessary equipment at the start of the trek. If necessary, the HVTreks’ guide will request additions of necessary equipment when and where it is available. -Note: In the larger towns and cities of Nepal, pharmacies have available common over-the-counter pharmaceuticals. Western/foreign brand name products and prescription drugs are not. We suggest you bring the pharmaceuticals you use in enough quantity. Please Do Not bring sleeping pills as they are a respiratory depressant.